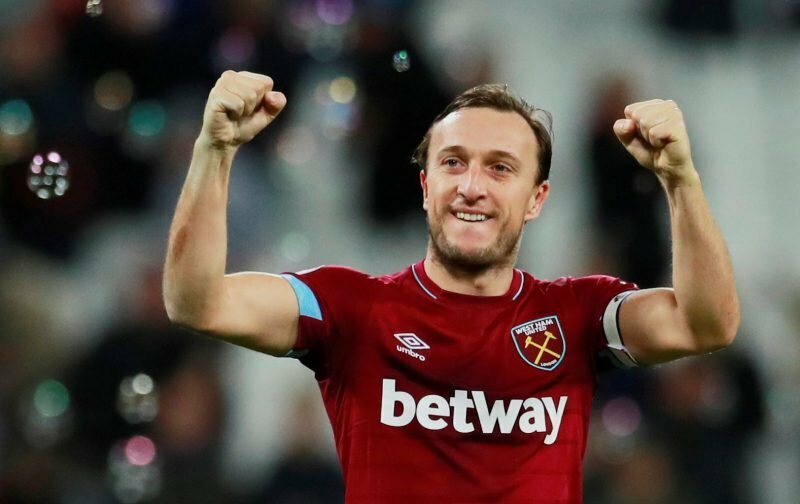 Mark Noble’s performances may have dropped from time to time in recent years, but the Canning Town-born midfielder is still Mr West Ham for podcaster and club presenter Chris Scull. The host of the club’s TV channel used the international break to recollect over the 31-year-old’s career in Claret and Blue, and pay tribute to someone he considers to be a club legend, even though the final chapters of his story are still being written. He notes how Noble burst out of the academy to make his debut at 17-years-old in the League Cup, and went on to be named the Young Hammer of the Year award runner up in his first season. Then, when we lost late on to Tottenham in 2007, could be seen with tears in his eyes, before bursting with joy at opening the scoring later on in the season against Middlesbrough. He, of course, also stayed with us after our relegation back into the Championship under Avram Grant, and his efforts in our promotion campaign earned him his maiden Hammer of the Year award. No matter what he did, or does, in East London has proved his worth to the England set-up, however, and he will likely end his career without a senior Three Lions cap. At the London Stadium, though, he is a leader and continues to wear the armband with pride, and that is something Scull is insistent on savouring, for Noble is a “true Hammers legend in the making”. To date, our captain has amassed 461 outings in Claret and Blue, scoring 54 times and assisting a further 56 – no player has made more Premier League appearances for West Ham than he has. He’s been a great servant to the club yes and had great seasons in 2007 & 2016. However he has been kept on beyond his natural span of playing at this level due his unique local boy status, with lucrative long term contracts awarded by the club, to help with the stadium move. Love him, many west ham managers been through he’s always been first name in the sheet. Mark will probably be the last of his kind, childhood club, and been there his whole career, as a football player I am not his biggest fan, as a man I have nothing but the utmost respect for him ⚒️???? I feel it’s just criminal that he’s never got a cap for the England team, year in year out he’s had passion for the game like no other, in recent events he’s been a bit poor, but that’s normal seeing he’s coming to the end of his career.